Camshaft locking tool x 2 – No.EN-46781. Camshaft sprocket holding tool – No.KM-6347. Camshaft sprocket holding tool handle – No.KM-956-1. Crankshaft pulley hub holding tool – No.KM-662-C. Crankshaft timing pin – No.EN-46785. Flat sections on camshaft locking tool must be in horizontal position  . Turn crankshaft in direction of rotation until both camshaft locking tools engage. Remove timing chain tensioner, tensioner rail and chain guide. Remove timing chain, crankshaft sprocket and camshaft sprocket as an assembly. Install timing chain, crankshaft sprocket and camshaft sprocket as an assembly. Tighten camshaft sprocket bolt to 150 Nm. 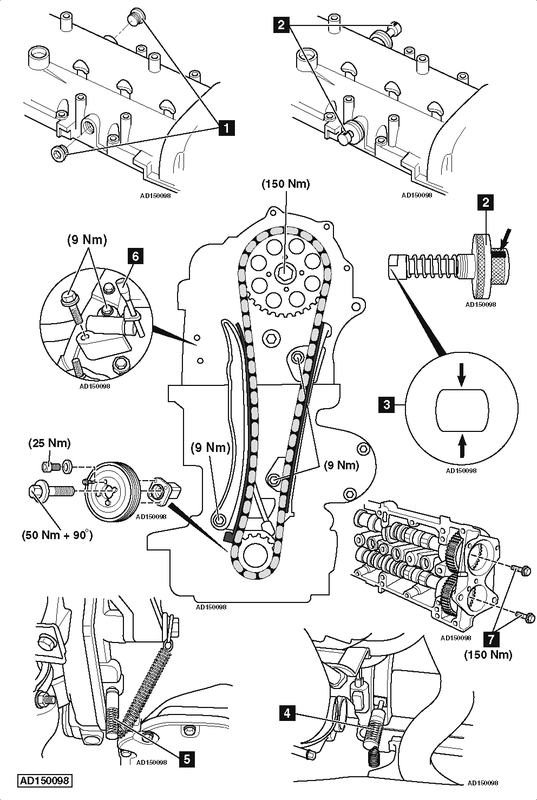 Install timing chain tensioner, tensioner rail and chain guide. Remove timing chain tensioner locking pin  . NOTE: Crankshaft damper hub bolt has LH thread. When replacing camshaft sprocket or crankshaft sprocket ensure writing on the sprocket faces outwards. Ensure camshaft locking tools correctly fitted  . Slacken bolt of each camshaft gear  . Remove camshaft locking tools  . Remove camshafts and camshaft gears. Install camshafts and camshaft gears. Finger tighten bolts. Tighten bolt of each camshaft gear to 150 Nm  .